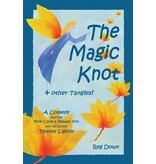 Author: Reg Down Age Range: Gr 2-4 The Magic Knot is a making-tale comedy starring Pine Cone and Pepper Pot the gnomes. They decide, since it is soon to be Tiptoes' birthday and she has no furniture in her house, to make her one table and three chairs. A simple task for clever gnomes - so we would think! But, from the finding of the 'perfect' branch to getting the table and chairs to the top of the Great Oak Tree where Tiptoes' acorn house swings back and forth, things go awry. On the way they get help from a host of friends: Ompliant the Elephant, Jeremy Mouse, the Carpenter Ants, Chiron the Pony and Spin-a-lot the Spider (to name just a few). Finally, when her surprise birthday party rolls around, Tiptoes tells the enchanting tale of how she came to live in the Great Oak Tree as a daughter of Father Sun and Mother Wind. An additional story, The Tale of None, is found at the end of the book. It is about a ladybug who had no spots—none at all!—until she completes her spot-finding journey to India, Africa and America. 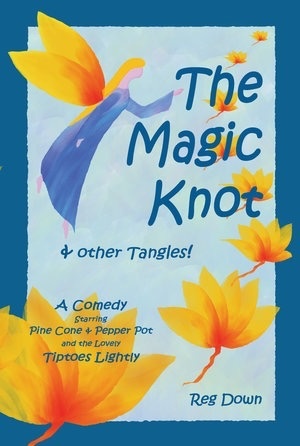 Lavishly illustrated by the artist-author, The Magic Knot is full of innocent, sanguine humor, and is suitable for reading to young children or for young children to read (ages 4 to 9). Soft cover, 108 pages.